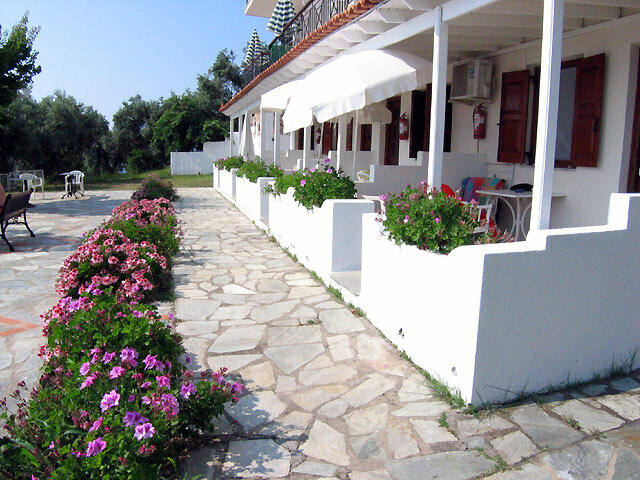 Vassilias Beach apartments, is comprised of 3 villas, situated on the beautiful island of Skiathos. The villas look out over Vassilias Bay, only 3 kilometers from Skiathos town. It is a family run business, which has been catering to holiday makers for over 20 years. The apartments were completely renovated in 2004. The view from all apartments, which face the sea, is breath taking. All the verandas face the sea, and from here on the fresh summer mornings you can see the sky change as the sun rises, whilst the view is perfect watching the activity to the harbor below and the boats as they pass (at eye-level) in front of you! The apartments sleep up to five people and the studios sleep up to three. They are all self-contained with independent entrances, their own kitchens and bathrooms. Daily cleaning service and full breakfast are provided. Each apartment has a direct phone line, TV and air conditioning. Post, fax, internet, exchange and safe box services are provided at the reception hall. The beach is a minute walk (60-120 meters) down the private road (also accessible by car). Vassilias bay is a quiet, sandy beach with a spectacular view to the islands of Tsoungria and Arkos and the town of Skiathos. All water sports are provided by qualified instructor (by the British Water Ski Federation). Boat parking is also available. There is a convenient bus stop 50 meters outside the house, with adequate parking spaces available for those with cars. Just minutes away are two small supermarkets which deliver food, beverages etc. directly to the villa. In addition to car and motorbike rental, speed boats are also available for rental on a daily or weekly basis. On the beach, guests find the Traditional Greek restaurant Ta Nissia, specialized in fish and all kinds of sea food. Delicious traditional dishes are served overlooking the stunning view of the islands for a truly unforgettable meal. Just meters away, relaxing cocktails are served at our small private Pool bar Ta Nissia (open all day). We would like to point out that through our site, you can now book your accommodation, but you can also book your ferry boat tickets (if sea travel is preferred), at competitive rates. In all cases e-tickets are issued. We look forward to seeing you in Skiathos.